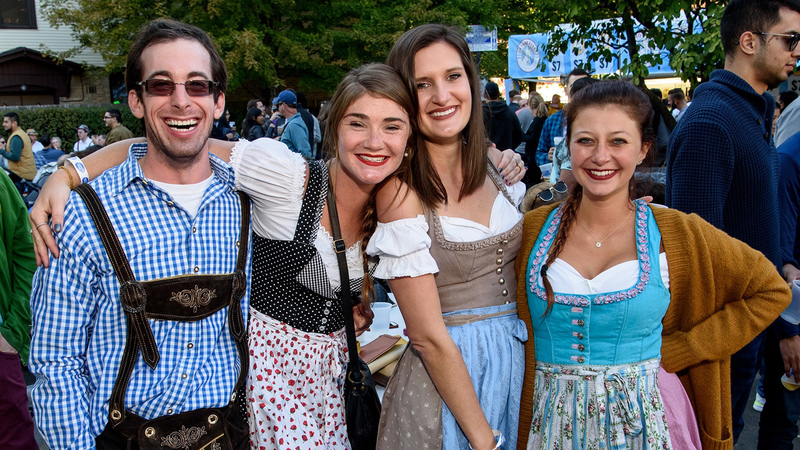 Beers, brats and bands headline Oktoberfest Chicago. Put on your lederhosen or dirndl and raise a glass to fall. A pair of stages provide musical entertainment from Bavarian beats to polka and popular tribute acts, including performances by 16 Candles, Rod Tuffcurls & The Bench Press and Run Forrest Run. Bonus: Craft beer tastings are on tap from 6-9 p.m. Friday and Saturday for an added cost of $50 and include 20 samples, a souvenir glass and pretzel necklace. Admire the handiwork of nearly 200 local artists at the Beverly Art Walk that spans 60 businesses, vacant storefronts and public art locations across the neighborhood. Expect to see pottery, jewelry, sculpture, textiles and photography. Free trolleys will be available throughout the route. Live music, art demonstrations, food trucks, craft beer and children’s activities round things out. See how older homes have been preserved and adapted for modern living at Historic Berwyn’s Bungalow Tour. A range of homes, historical sites and even some notable commercial buildings will be showcased during the tour. Check in at the Berwyn Depot Train Station. Go on an out-of-this world adventure at Family After Dark: Sci-Fi & Fantasy Adventure. Create your own alien world, navigate an alien obstacle course and experiment with dry ice to learn about environments on other planets. Bonus: Costumed characters will be on hand and a DJ will provide supersonic beats to get you moving your feet. Browse the artistic creations of more than 135 international painters, photographers, sculptors and more at EXPO Chicago. This year’s event aligns with Art Design Chicago, a yearlong celebration of the city’s art, and will feature panel discussions with leading artists, curators and designers. In addition to admiring artists’ works at Navy Pier, you can see them scattered along the lakefront and in Chicago neighborhoods. Judy Chicago, Women and Smoke, 1971. EXPO VIDEO, Curated by Anna Gritz (Curator, KW Institute for Contemporary Art, Berlin). Image courtesy of Jessica Silverman Gallery, San Francisco and Salon 94 (New York) and EXPO CHICAGO. Taiko drumming, calligraphy and martial arts are among the many highlights of Chicago Japanese Matsuri. Participate in a cosplay contest, try your hand at origami and snap a few pics in a photo booth while enjoying authentic Japanese festival foods. More than 30 musicians descend on the South Side for the Hyde Park Jazz Festival, including Jason Moran, Dee Alexander, Christian Scott aTunde Adjuah and Ravi Coltrane with Brandee Younger. The 12th annual event will feature performances at nearly a dozen venues, such as the Rockefeller Chapel, Midway Plaisance and Hyde Park Bank. Discover the talents of emerging and undiscovered artists, including dozens from Chicago, at The Other Art Fair. Take a crash course in art collecting (3:15-4 p.m. Friday) before browsing the jewelry, paintings, photographs, sculptures and mixed media works for sale. Chicago art icon Hebru Brantley created an original piece “Girl with Red Scarf,” sales of which will benefit the nonprofit arts charity Little Black Pearl. He spread his apple seeds across the nation and you have the chance to meet him at Johnny Appleseed Fest. The folklore legend will be portrayed by historian and educator Steve McPhail, who will walk the fest grounds educating attendees. Learn how an antique apple cider press works from the local historical society, test your apple pie-baking skills in a contest and enjoy apple-inspired delights. Celebrate national public land’s day at Party for the Preserves. Hosted by the Forest Preserves of Cook County, the bash will be held at the county’s first forest preserve and include bird and nature walks, a native plant sale, live music, stargazing with the Adler Planetarium and more.